Where to Retire is the authoritative source of useful information for the 700,000 Americans a year who move to new towns to retire. It is the only magazine of its kind and, for advertisers, it is the only pure slice of this well-educated, well-traveled and affluent market. 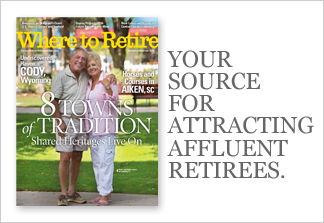 Where to Retire profiles top retirement states, towns and developments and tells readers how to buy and sell homes, how to weigh tax and cost-of- living considerations, and covers the key financial, cultural and emotional aspects of relocation. 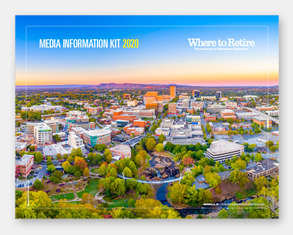 If you want to attract affluent retirees to your state, town, development, real estate office or financial institution, Where to Retire is the place to be.